If you thought Android powerhouse manufacturers Samsung and Motorola were going to rest on their accomplishments with the Galaxy Tab and XOOM (respectively), think again. In separate announcements today, it was revealed that both companies are already working on tablet sequels. 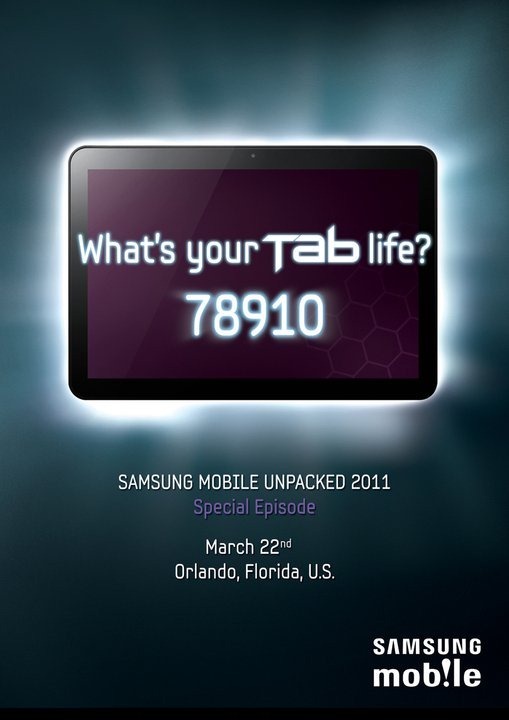 In a Facebook PR post for the upcoming "Samsung Mobile Unpacked" event on March 22, the Galaxy Tab maker posted an image of an unknown Honeycomb-running tablet with the numbers "78910" on the screen, accompanied by the question "What's your Tab life?" Whether these numbers refer to display sizes or not is still up for debate (let's just hope the figures aren't the price, shall we?). Of course, we have already heard about the Galaxy Tab 2, which may or may not be the same device as the Galaxy Tab 10.1. No matter what Sammy has in store for us, we'll be watching this event closely. Not to be outdone, Motorola announced at the Morgan Stanley's Media and Telecom Conference that they are developing a 7-inch tablet to succeed the 10" XOOM. They didn't rule out other tablet sizes (in 8" or 9" form factors), and stated that they "will have other tablets out by the end of the year." We already knew that the Android tablet market was set to explode this year, but are slates hitting us harder than you expected? Let us know in the comments!